Clare Kelley is a certified forest therapy guide (cohort 10), movement educator, and advocate for public health. She has devoted countless hours of training and exploring health, nature connection, movement and yoga, kinesiology, anatomy, and neurology. The earth is her ally, nature is her playground, and her body a compass. Carrying an extraordinary breadth and depth of knowledge, she studied health sciences (MA/MPH) at the George Washington University with a concentration in study design, monitoring, and evaluation. She has almost 15 years of experience working with health research, programming, and application, including working with the American Society of Hematology, National Cancer Institutes in the US, Mexico, Brazil, Uruguay, and Peru, Mulago Hospital in Uganda, and Health Volunteers Overseas. Clare was awarded the Louis N. Cotlow award for her ethnographic field work in Tacna, Peru. Her undergraduate work concentrated on US history of race relations, anthropological linguistics, and piano performance.Following an environmental poisoning that changed her brain, Clare shifted her work to connecting people to their health and nature. In recent years she has favored curiosity over authoritative knowledge, student-led learning, hands-on sensory experiencing, and guiding her students and clients to discover what they need to know to feel whole and connected.Clare currently runs DC Forest Bathing, applying her public health background and movement expertise to bringing the healing benefits of nature to stressed out people in her peculiar, biophilic city. She regularly guides, including full moon walks at the National Arboretum, walks for families, children, and teens, burnt-out doctors and health students, nonverbal and neuroatypical people, people working with PTSD, and those who just need a break from the hectic pace of DC. Clare serves as an advisory board member on public health to ANFT. 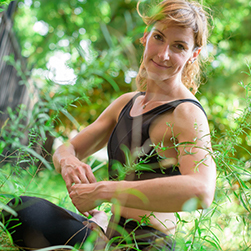 A master of embodied movement, Clare teaches Pilates, yoga, and functional movement in Washington, DC. She holds a special certificate in working with neurological conditions. Emphasizing inclusivity, her work interweaves science, wisdom traditions, love of play and nature, and the metaphysical. She lives six blocks from the White House with her two house panthers, Francie and Neely, and 90 plants.